This year’s E&I Fest and Startup Homecoming 2018 programme was filled with entrepreneurship- and innovation- themed events held from 15-19 and 22 October in Nanyang Technological University, Singapore. 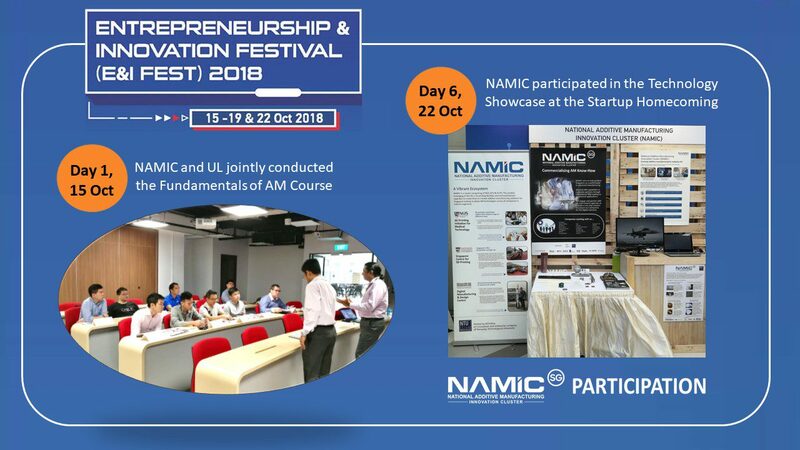 Despite its busy week hosting the Global AM Summit and the Startup pavilion held in conjunction with the Industrial Transformation ASIA PACIFIC from 16 to 18 October, NAMIC participated actively on the opening and closing day of the E&I Fest. NAMIC partnered UL in presenting the inaugural international launch of the UL and Tooling-U SME Additive Manufacturing Fundamentals Review Programme and Certification exam on the opening day. NAMIC also participated in the technology showcase at the Startup Homecoming event on 22 October. It was organised by NTU-NTUitive to bring together the many entrepreneurs and startups that they have been working over the last few years.